I'm always fascinated when I see these industrial wind turbine blades. Since it's an oversized load, they're usually moving during the day. Once the sun sets, they have to park and settle in for the night. I saw a whole group of trucks hauling these lined up at a rest area in Texas. They don't look so big when you see them in the distance, on the windmills, but when you drive up next to them, they're massive. The most widely used blades, made by General Electric are 116-feet long and sit atop a 212-foot tower for a total height of 328 feet. The blades sweep a vertical airspace of just under an acre. 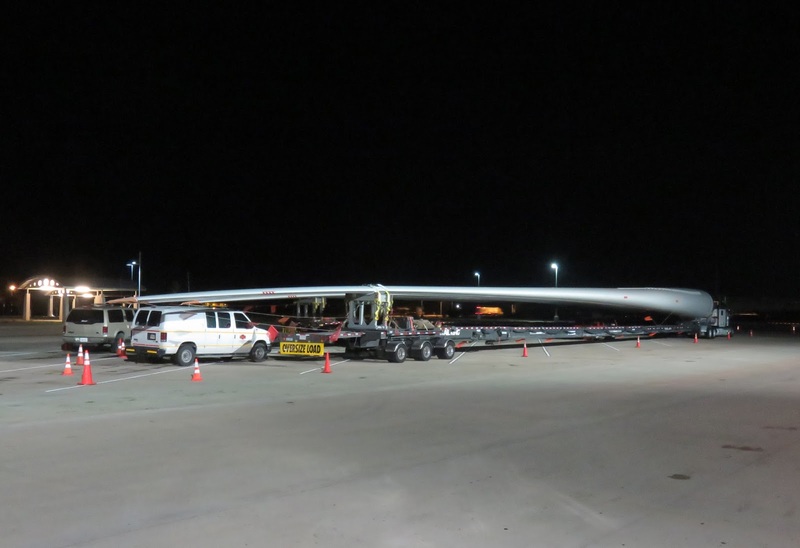 Other models use blades that are 143 and 148 feet long. Amazing.